Global Travel Media » Blog Archive » Marvelous May, the 1st Anniversary – U Paasha. Marvelous May, the 1st Anniversary – U Paasha. Time flies when you’re having fun and U Paasha Seminyak is proud to announce that we’re rapidly approaching our first birthday. To celebrate we’d like to introduce you to two exciting promotions that bring extra added value to your stay on the beautiful island of Bali. 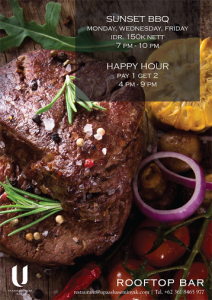 Mondays, Wednesdays and Fridays at the rooftop pool bar is a place not to be missed for all BBQ lovers. Chef and his team have prepared a selection of the choicest barbeque treats grilled to perfection including German bratwurst, Balinese satay, marinated chicken wings, beef steak, pork ribs, calamari and fish of the day with accompanying sauces plus a choice of potatoes, salads, soups, vegetable dishes, desserts and fresh fruit all for the unbeatable all you can eat price of IDR 150k net. For people who’d also like to enjoy the full U experience we offer a “Best Rate Guarantee”. If you book directly with us we will give you the best rate available with no hidden charges or extra costs, instant confirmation, fast amendments or cancellations, flexible terms of payment and priority upgrades if necessary. Plus if you find a better rate anywhere we will be delighted to honour that rate and give you an extra 15% discount. Sunset Barbeque at the Rooftop Bar is available from 7 – 10 p.m. on Mondays, Wednesdays and Fridays priced at IDR 150k net per person.